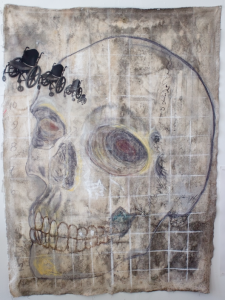 My recent work, a large skull drawn on a piece of decaying canvas, keeps drawing me back – is it actually an entrance to a new way into investigating my own history of disability? I have been exploring the subject of the wheel chair and its relationship with the body for much of my art practise. At Luminous Bodies residency I will build an opening to a visual record (video) of the body in residence – in the wheelchair. The social construct that is imposed and given value and me, the labelled disabled. I am hoping to engage in two concurrent projects during this residency – I will arrive with multiple images printed on sheer fabric that I plan to turn into a transparent storyboard quilt illustrating death and rebirth. I am expecting to use the stitching process as a simple meditative process. I am also hoping to use this as another entry point to research the development of a city of thread representative of cultural shifts and changes in viewing disability. I have begun to assemble a base of knowledge for this project with the book Invisible Cities by Italo Calvino and artworks that developed in response to the book. Elaine Stewart is a Toronto based artist who uses a variety of materials in her work from fabric to wood to paint. She holds an extensive creative history as a garment designer. More recently, she has been studying painting, photography and collage at Toronto School of Art, and is currently studying painting at OCADU. Her practice has evolved as an exploration of the constant shifting of the ability/disability paradigm. As an artist working with fibre, assemblages and structures, Elaine travels metaphorically through a familiar yet unknown landscapes.